Did you know you can have different applications specific to roles or jobs that you post? From a recruitment marketing perspective, it makes sense to tailor your employment application to the role that is posted. This can make it easier for people to apply. Depending on the types of roles that you post you may want to consider changing things up a bit. Someone applying or showing interest in a senior role such as a CFO or an IT Manager may not have the time available to invest in completing a long application. It may make sense for you to add a new application that keeps things much shorter for potential candidates in higher tier roles. We recommend keeping things simple, requesting only “basic” information to begin with, including, name, address, contact information. Availability, and how did they become aware of your advertisement. Attach a resume and perhaps a cover letter. Keep things simple. Keep in mind, for candidates that you have established interest in, you can always request additional information through iRecruit. Other situations you may need a job specific apply process include driving roles. Drivers. CDL drivers, long distance drivers, bus drivers or even delivery drivers usually require additional information on their employment application that shows states in which they are licensed, history of any accidents, and any traffic convictions. Licensed Professionals such as nurses, doctors, therapy professionals. You can add a license and certifications section for those roles to your application collecting relevant information such as type of license, state issued, and expiration date(s). Experience Specific. You have a role that requires highly detailed knowledge of certain tasks or functions. 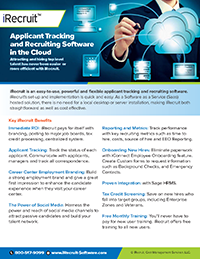 Collect that information with a job specific application. This entry was posted in Blog, iRecruit Blog and tagged career center, employment application for specific roles, iRecruit, Job Specific Apply Process, online employment application. Bookmark the permalink.